A few posts ago, we looked at how temperature affected the passing game. This time, we’ll look at the running game. Often, analysts will discuss how winds and cold might affect passes, but unless the conditions are exceptionally snowy or muddy, rarely does anyone consider how cold weather affects running. And why would they? I’d agree there isn’t much reason to suspect that cold temperature alone would cause runs to be any longer or shorter than in moderate weather. Before we look at the numbers, I should note that running and passing are connected in game theory terms. The better a team’s passing attack, the more an opposing defense needs to respect it, possibly allowing bigger running gains. And same goes for a great running attack. The better it is, the more the defense needs to be on guard near the line of scrimmage, lowering its guard against the pass. Cold temperatures, or at least the kinds of conditions that go along with cold temperatures, appear to reduce the effectiveness of passing. With that in mind, defenses might be worried slightly less about deep passes and stack the box in cold temperatures. Thus, we might expect that cold temperatures could indirectly reduce the effectiveness of running. This is where it gets really interesting, because that’s not what happens at all. The graph below plots the yards per carry (YPC) for all runs since 2000 according to game temperature. Home team YPC is in red, and visiting team YPC is in blue. 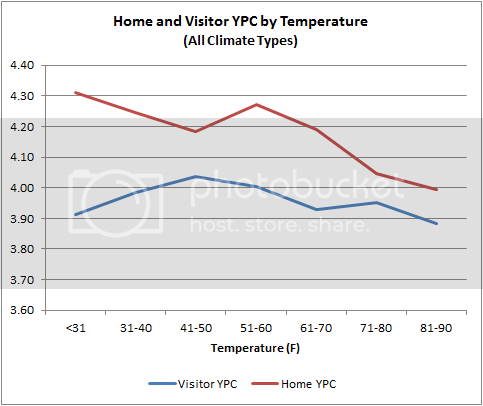 Visitor YPC is fairly flat, and as expected, it’s lower than home YPC. What’s so interesting is that home YPC steadily climbs (apparently) as the temperature drops. There is an unmistakable trend. The obvious question is, over the period covered by the data, have teams that come from colder climates tended to be the better running teams? That would explain the increase in YPC for home teams in cold weather. If that’s the case, and outdoor teams from up north have been the better running teams, then we’d see those same teams have higher than expected YPC on the road and in more moderate temperatures. But that’s not the case. The ‘cold’ weather teams get almost exactly the same YPC as the other climate types do when on the road in warmer temperatures. 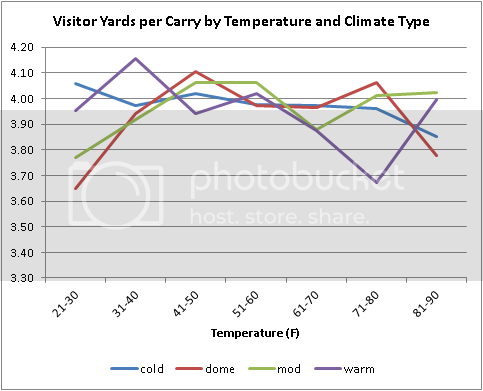 Cold, dome, moderate, and warm climate teams average 3.97, 3.99, 3.99, and 3.89 YPC (respectively) on the road when the weather is above 50 degrees. Below you can see that cold climate teams do not appear to be stronger running teams than the other types, at least at moderate temperatures. Only the warm climate teams (of which there are the fewest) show any detectable deviation from the typical 4 YPC that road teams get. That's worth investigating further because it might explain the difference. 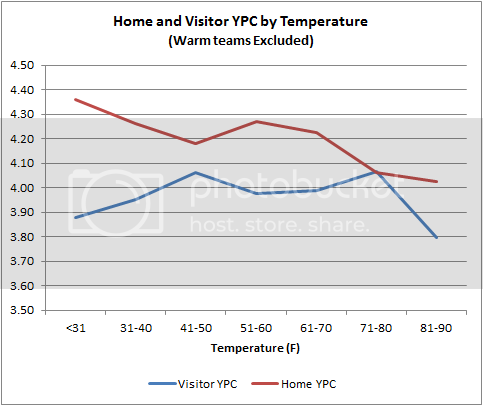 Warm weather teams don't have cold home games, and if they've happened to be poor running teams, that would explain the increase in home YPC as the weather gets colder. I've replotted the graph above, but this time with the warm climate teams removed. The same effect remains. (Note that if I remove the cold teams from the chart, there aren't enough cold games in the sample.) So cold climate teams aren’t likely to be better the running teams than the others, which leaves us wondering why home teams run better in the cold while visiting teams remain flat. The prime suspect should be our good friend the dome team. This phenomenon may help explain why dome teams win so few games in the cold. Instead, it appears that all climate types are affected by the cold when on the road. The data are noisy, but there appears to be a universal trend that they each allow more yards by a home team when the weather is cold. 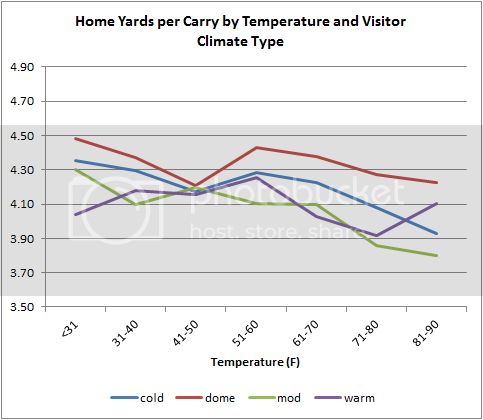 The dome teams are worst overall among the four climate types, but there is a similar trend for all types of road teams, even other cold climate teams. I'd still suspect that somehow, someway, northern outdoor teams might just be better running teams, despite not showing any better stats when on the road. It would be the simplest explanation. Playoffs would be the other obvious factor. But removing those games from the sample doesn't change the chart one bit. I'm stumped at this point. Could it be snowy conditions? I don't have precipitation coded out in the data yet, but there are so few snowy games the effect would have to be extremely large to make a difference. Plus, it wouldn't explain the overall trend of increasing YPC for home teams in temperatures above which snow is around. Once all the other factors are eliminated, we might be left with the theory that there is some interaction effect between cold weather and home field advantage in the running game. It would be quite a strong effect, changing a home team's YPC from 4.05 in the 70's and 80's to over 4.30 when the temperature is below freezing. That would be like taking the 23rd best running team in the league and making them the 15th best this season. The dip going from 51-60 to 41-50 is interesting as well. Perhaps the cold weather has more of an effect on anyone who has recently arrived in a given city. I live in a northern locale, and after spending time in a warm, southern location during the winter, it always feels much colder upon returning than it did before the trip, even if the temperature is about the same. A football player who lives in Green Bay during the season will be more used to the cold than someone who is just in town for a road game. This might be the case even if it's a cold-weather road team, since not all "cold-weather" cities are equally cold at the same time; it may be 40 degrees in Cincinnati and 20 in Foxboro. How much of this diference is caused by the Patriots? I can't find cold weather/snow game splits anywhere, but anecdotally they seep to be truly exceptional at all facets of the game in the snow. It does seem unlikely that a couple of snow games would skew the results all that much, and even if they are a large part that still does not answer the question of why, but I am curious. if the passing game is less effective, maybe you end up having more runs in long yardage situations where you're more likely to gain greater yardage. I.e. it's easier to gain 6 yards on 3rd and 10 then on 3rd and 1. Poor footing will help the running game all around, since the runner has the advantage of "opposition" and knows where he's going to cut. The defender will have a tougher time responding in my opinion. Footing will be worse in cold weather, even without precipitation. The grounds' going to be harder. I guess. Shoot, I just typed that whole thing out as if I know what I'm talking about. I would agree with Jonathan about the footing issue and add one more thing: equipment. The home team knows what equipment will work best on their field whether it is long spikes, short spikes, no spikes, etc. They may also have more staff and different types of equipment available than a team that is traveling. Since each turf and ground composition is different, the home team will know what works better than the opposition. Jonathan, I can see how poor footing will help the running game, but that doesn't explain why it is ONLY helping the home team and not the away team. Following up with Anonymous about the home team knowing their field better, do home teams in general run better in the first half than the away teams? I say 1st half because (and correct me if I'm wrong) the teams can't change their shoes until half time. So if the away team misjudges the field conditions, they will have to play with he incorrect equipment until halftime. While the home team (with more experience) can get the correct footgear from the get go. I can also testify to the effect Matt W. has experienced. In Tok, AK, we get big temperature shifts in the winter. After a week at -60 F, an upswing to -20 feels like t-shirt weather. Coming the other way, from a nice 60F in the Bay Area, -20 is painful. Also interesting would be to compare histograms of run lengths in the cold of home vs away teams. Is the average changed by the long runs being longer? More long runs? Higher median run? It seems like that would be an important clue. Perhaps this is a case where the cause is not readily isolated statistically. Any coach or player will tell you that football is a game of emotion. This is more true for running attacks, which are less dependent on comlex technical execution than passing attacks. The difference between having a home crowd cheering you on and not, when it's miserably cold, could have a tangible impact. Cold games also happen later in the year when players have a season's worth of injuries accumulated, and those would only increase the emotional challenge of a cold game. Sorry, I thought this analysis could use some wild speculation. Perhaps the same analysis could be performed comparing home/away running success the length of the injury reports (but you might need to exlude the NEP for that). I think a factor might be that it's harder to tackle in the cold. Take a look at the sidelines. Away teams playing in cold weather do not always have the same equipment on the sideline to warm up as the home team. This can effect both offense and defense. I'd also look at missed tackles and broken tackles for comparison of home and away rushing averages in different temperatures, because rushing effectiveness is also based on defensive performance. Cold weather makes hits more painful. Linemen tend to deal with it better as they are large maintaining heat and hit on every play lessening the severity of the pain. Warm weather defensive backs, on the other hand, don't have a lot of contact and are smaller requiring more effort to keep warm (clothes, time in front of heaters, etc). This makes them more likely to miss tackles in cold temperatures. Have you considered human motivation as a possible factor? If the backs and their coaches know that the passing game is going need more help from the run due to weather, the responsibility of yardage shifts somewhat to the runner. It is possible that cold wether teams take this into account when choosing and training their running backs. It is also possible that stats correlate with a players (or coach's) assessment of the importance of his performance. are quarterback runs included in your data?